Paradoxology: Brian McLaren: "The Secret Message of Jesus"
Some will undoutedly hail McLaren's latest book as his best ever -- and for good reason. 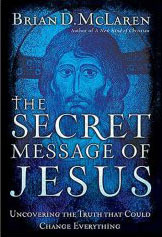 Scheduled for release in the next week or two, "The Secret Message of Jesus: Uncovering the Truth that Could Change Everything" is an easy-to-understand treatise concerning Jesus' revolutionary teaching concerning the kingdom of God. Having practically been weaned on the insights of George Eldon Ladd regarding the "already-not yet" nature of the kingdom of God, I personally found myself not very surprised by McLaren's revelation that the kingdom is both a present reality and opportunity. Serious students of the Gospels have long recognized the political, socio-economic, and spiritual implications embedded within Jesus' teachings. Three prominent works that immediately come to mind are: "Binding the Strong Man:A Political Reading of Mark's Story of Jesus," by Ched Myers (1988); "Jesus and the Spiral of Violence: Popular Jewish Resistance in Roman Palestine," by Richard A. Horsley (1987); and "In Memory of Her: A Feminist Theological Reconstruction of Christian Origins," by Elisabeth Schussler Fiorenza (1983). McLaren is certainly not trailblazing any new territory here. But what he is doing, in fact, throughout The Secret Message of Jesus, is introducing his target audience (and it's NOT the theological intelligencia) to the idea that Jesus actually "came to start a political, social, religious, artistic, economic, intellectual, and spiritual revolution that would give birth to a new world" (p.4). And you know what? He does an excellent job of doing just that. Here he introduces readers to the political and socio-economic message embedded within Jesus' teachings. The reality of the "present kingdom" and it's various and revolutionary implications are explained and developed in this section. McLaren devotes a good deal of space in this section challenging contemporary notions of heaven, hell, and especially eschatology. The astute observer will probably recognize a preterist and/or amillennial influence throughout this section. In the concluding chapters (i.e. Appendix 2), McLaren reveals who it is that has most influenced and inspired him to write this latest undertaking. They include the likes of Dallas Willard, N.T. Wright, Walter Wink, John Howard Yoder, Walter Brueggemann, Sharon Welch, Howard Snyder, Jim Wallis, and several others. I'd say that's a pretty impressive list! And their collective influence certainly shows in McLaren's writing. I highly recommend that you get a copy and read The Secret Message of Jesus -- even if you haven't been all the much of a McLaren fan. In fact, I wouldn't be surprised if -- after reading this book -- some of Brian's "critics" end up doing a little backpeddling. IMPORTANT ANNOUNCEMENT: I am currently working with Brian's publicist in arranging a date for him to pay us a visit here at Paradoxology. When it happens, Brian would be checking in here throughout the day in order to read your questions and thoughts and respond to them. It will be an excellent chance for us all to interact, so keep your eyes peeled here for a future announcement with all the details! "came to start a political, social, religious, artistic, economic, intellectual, and spiritual revolution that would give birth to a new world"
I believe that this casts the question: Is this book about the Gospel Jesus supplied the church, or is it an alien Gospel? The way I read scripture God destroys the Earth with Fire, Jesus and the holy martyrs destroy The Pseudo-Christ, and death is destroyed. There is a judgement and a resurection. This is done together with the church, but is not done by the church alone. The left loves the idea of revolution, because that is the origion of the left. But Jesus is no revolutionary, He is the legitimate king provided by God The Father to remove an unwelcome tennant of the Earth, the Devil. In all the things mentioned above The Holy Spirit wasnt mentioned once, and this shows the disconnect with legitimate Christianity (spiritual by The Holy Spirit) vs. enlightenmnet Christianity (philosophical and humanist). So they change the scripture to read, "By our might, and by our own power, but not by The Spirit, says the Lord". Thus it is revolution, and not by God's Spirit. As a premise for all left-wing thinking is the idea that there really is no active Holy Spirit, that is: not a living God. And therefore there could be NO Methodist santification. It's interesting how Gnostic in tone this book is, and even the so called "Secret" things he ends up talking about really aren't that secret (Not if you are serious student of the Gospel, Church History and so forth). Gee wiz guys. I don't particularly like or dislike McLaren, but how about reading the book before vilifying it and him? I am excited about this book. Of course-it is a secret message! I have been in the evangelical church long enough to know that very few members sitting in the pews have any concept of the Kingdom of God. And this is due to the atonement-pop theology that has become common place in the church. I'm grateful Brian is not going to patronize me the way so many evangelical leaders due by dumbing down the message of Jesus. It sounds as if this book will be a good challange to read if he truly engages the ideas of Wright, Wink, Yoder, etc. I'm ired of the same message told over and over again and happy to report Mclaren has become one of my favorite authors due to his fresh and controversial ideas. Brian keep on taking risks, and I'll keep on being challenged and growing in the process. If I read the book backwards will I get the secret message? I would read the book, but (as above), I have read a bad review of it. "So I'm certainly not going to spend my precious money buying one of his books when it can be spent in a more constructive manner." Pavel, here's an idea for you: take Gina out for a Starbucks at Barnes & Noble in a couple of weeks, where you can sit down with a copy of McLaren's new book without having to buy it! Yeah we did that a few weeks back. One of my brothers gave her a star bucks gift card for Christmas that we are slowly using up. By the way Chris did you listen to the bleeding purple interview and what did you think of it? I heard what the guy had to say a while back on the link above. I just never bookmarked it. After hearing him before I can't see why reading him would be fruitful since he seriously doubts that Jesus is divine (he said so). I can tell a shill for socialist unitarian universalism when I hear it. Why not just read "The Last temptation of Christ?" Heres a good book on the gospels, "Son of Man" by Fr. Alexander Men. Its a great book that does shed light on the Gospels, not try to reinvent it. By way Chris, Seraphim and others I recommend this ooze thread which discusses the interview I previously mentioned. by the way here is one chestnut of that interview to encourage you to listen to the interview and read the thread.